I adore fried chicken but given my Brooklyn/Jewish DNA, it seemed beyond my capabilities. I always imagined needing sturdy forearms, a Southern accent and proximity to county fairs to do a decent job. Which is why I love this recipe – it’s foolproof, with minimal ingredients and best of all it’s finished in the oven so you’re done frying in half the time. 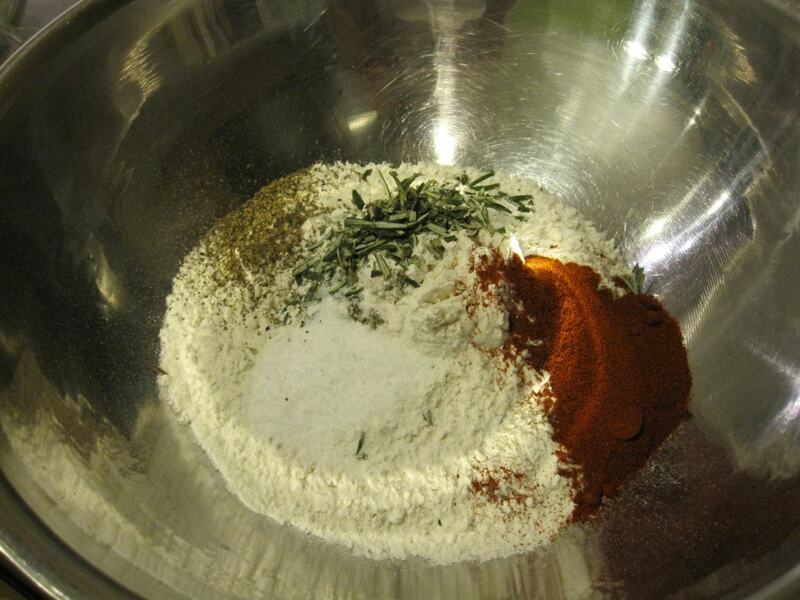 Plus, the use of the rosemary sprigs is pretty nifty. 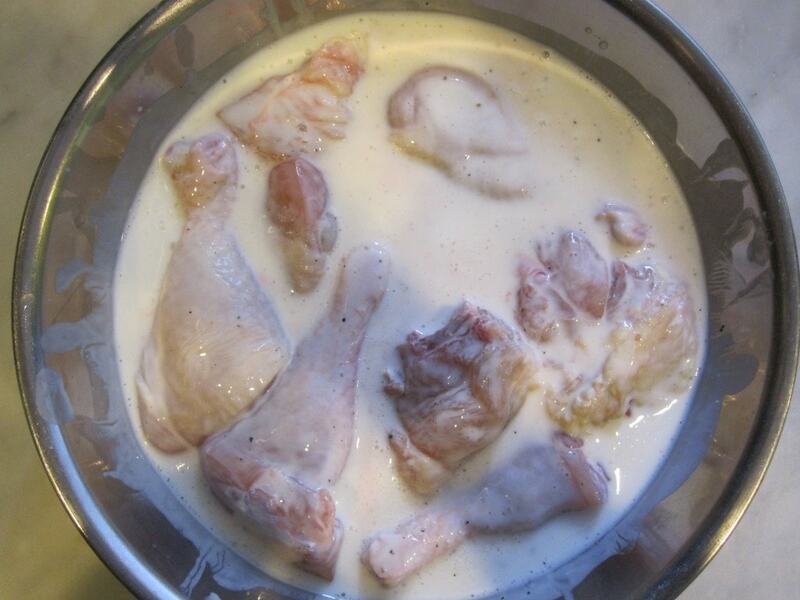 3-4 lbs of chicken parts – I usually use 1 package each of drumsticks and split breasts – you can use whatever your family likes. If you do use breasts cut them in half so they are closer in size to the rest of the pieces – this ensures that everything is done at the same time. 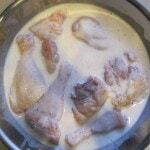 In a large bowl combine chicken pieces and buttermilk with 1t. salt and some ground pepper – refrigerate for several hours or up to 2 days. Line 2 baking sheets with foil. Place a cooling rack on one of the sheets and put aside. 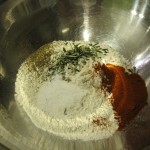 In another large bowl whisk the flour, paprika and chopped rosemary, 1T salt and 2t pepper. 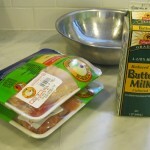 Dredge the chicken pieces in the flour mixture and place on the foil-lined sheet. Dredge all the pieces a second time and return to the same sheet. In a large skillet, pot or Dutch oven heat the oil and rosemary sprigs over med-hi heat until the rosemary sizzles rapidly – discard the sprigs. 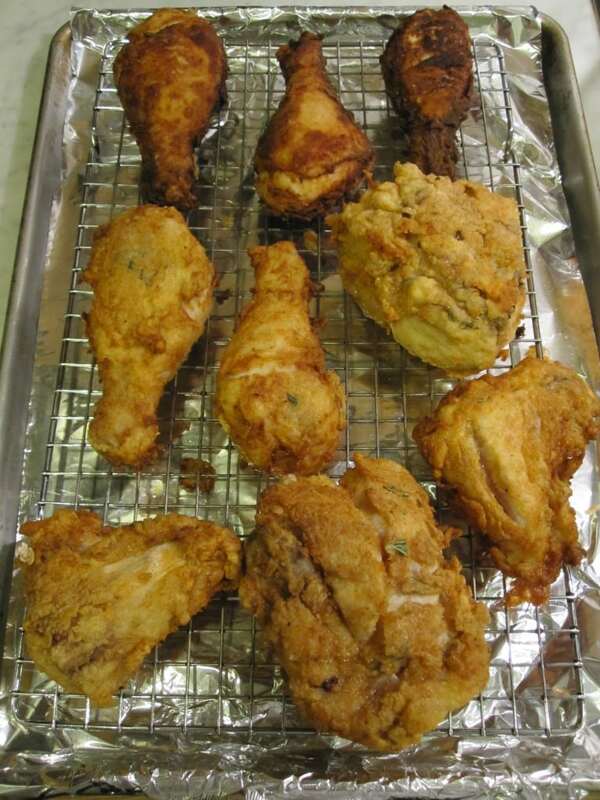 Fry the chicken in 2-3 batches till golden brown, turning once (this takes as little as 2 minutes per side or up to 5 minutes – best to watch carefully, as you can see I didn’t in the top row). Transfer the finished pieces to the rack-lined sheet. 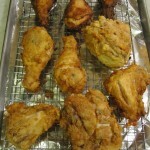 Bake chicken 15-20 minutes, or till a thermometer reads 170 degrees. Cool for 5 minutes before serving or serve at room temperature. Can also be made the day before and served cold or at room temperature. 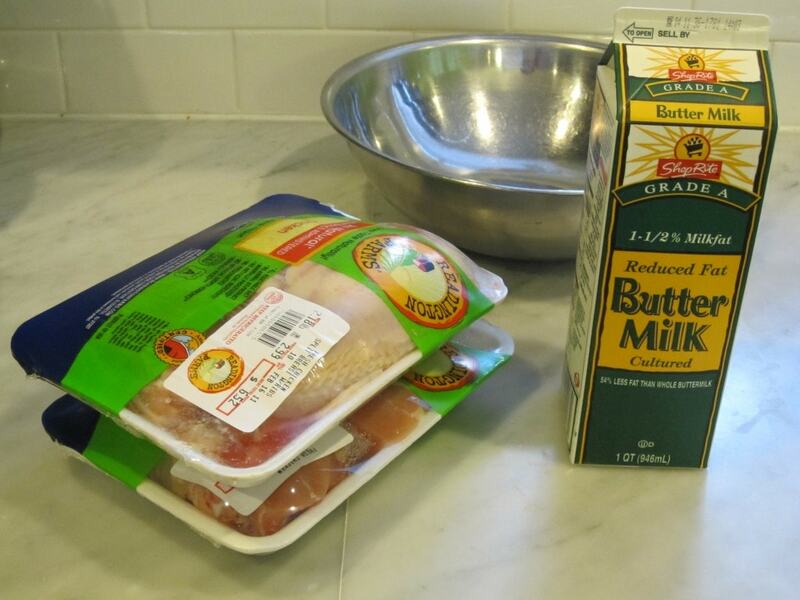 *what to do with the leftover buttermilk? Look here.